A robust and attractive addition to your garden furniture. This Zest 4 Leisure Caroline Bench comes complete with a large under seat storage box for you to store a variety of outdoor belongings. A traditional and classic styled bench for seating, it's comfortable exterior encourages relaxing during the summer months. 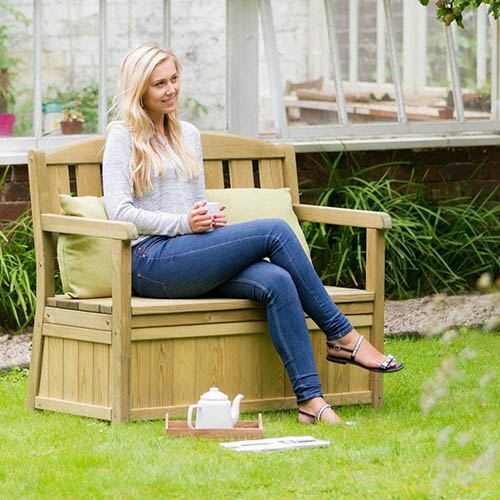 The Caroline Bench with Storage Box is manufactured from high quality, pressure treated, FSC® Certified timber to last longer, and comes with 10-year guarantee against rot so you can be sure that this product will last and remain to be a beautiful feature in your garden. Dimensions: 1.20m x 0.50m x 0.80m, assembly required - This product is 2-person assembly.